Before the collapse. I set up camp on a mound just to the right of Route 66 just outside of Prewitt, New Mexico. My tent broke last night and this time i'm not talking about a little tear on the side of the screen caused by a little night critter hungry for melon (refer back to my time camping on Fernandina Beach, Fl.). No, this time the damage was completely at fault of my own...or perhaps the weather had a play in it too, but i'd like to think that my tent broke because i've just gotten so freakishly strong on this tour. Yea, we'll just go with that. I've gotten so freakishly strong that as I was setting up my tent last night I managed to snap a section of my metal tent pole in half causing my home in a bundle to lean to one side and waver at any sort of movement or brush up against it. I'm pretty sure I could deadlift a car if I wanted, but i'm not going to do that. The fix, I thought would be as simple as duck tape, but after spending a few moments binding the two broken ends together, I quickly realized that not even the powerful cohesion of duck tape (DUCK TAPE!) could withstand the tension that was being placed onto the poles. As soon as I removed my hands from my tent, it sadly drooped to the side. It wasn't going to get much better than this, though. So I thought to "roll with the punches" and just go ahead and throw the tent cover over the frame and call it a night. Bad choice. Immediately after throwing over the tent cover, I heard a second snap, which caused my tent to lose form and completely collapse to the ground, granting it completely useless to me. The second break was located on a pole right in the center of the frame- a critical point for holding up any sort of structure, such as a tent. So now, not only do I now have to lug around a broken tent that weighs near 10 pounds with me for the rest of my tour, but I also have to sleep out in the open in freezing weather! On this particular night, the low was to get down to 27 degrees. There wasn't any time in my day to cycle any further towards a lodge or motel or anything, so I brought out all of my other sleeping gear: pad, ground tarp, sleeping bag, and a wool rug. I layered all of these things onto the ground, first starting with the sleeping pad. I then spread out the ground tarp, then placed my sleeping bag over top of that. The wool rug, which I had just bought earlier that day at an art trading post, was placed on top of my sleeping bag for added warmth. Lastly, the remaining slack from the ground tarp was thrown over the rug and all the layers underneath it to be used as a shield to ensure that my sleeping bag didn't get wet over night and accumulate frost. Selfie the next morning with frost on the hood of my sleeping bag. Overnight, temperatures got to a low of 27 degrees, a perfect recipe for frost covered shoes! I slept well. There were bits of me that were still cold over the night, mainly my toes, but overall the night was a success! I woke with just my eyes and nose peering out of my sleeping bag and saw that frost had built up onto my tarp and not anything else underneath it. My shoes were covered in frost, though. Should have stuck them under the tarp! Loves truck stop in Gallup, New Mexico. 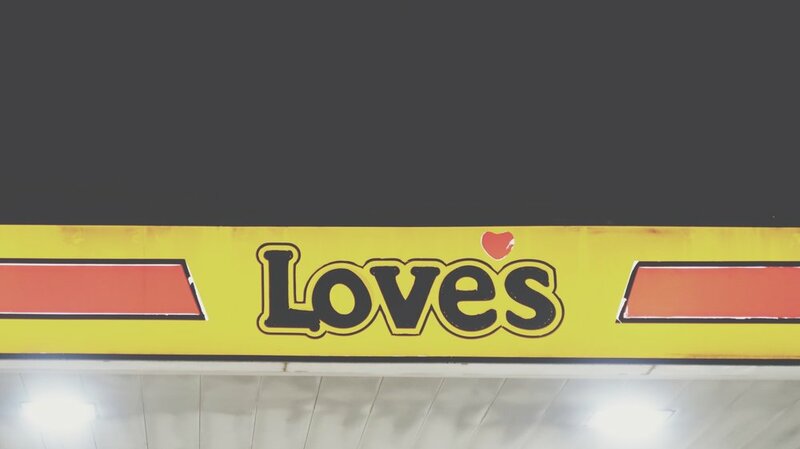 It's now the following night after the collapse of my tent and i've taken refuge at a Love's truck stop. The low for tonight is supposed to be another icy 26 degrees. Although this truck stop is open 24 hours, i'm wondering how long they will actually let me post up here before i've overstayed my welcome.